Concussions plunged in Ivy League football after the kickoff line was moved to thwart what might be the game’s most dangerous play, according to a study published Monday. The aim of the 5-yard move was to have more kickoffs land in the end zone and reduce returns. That play is one of the only times “where players on both teams have the space to get up to full speed” rushing at each other and potentially risking a head-on tackle, said University of Pennsylvania researcher Douglas Wiebe, the lead author. The 2016 change came at the recommendation of league coaches after data from the previous year showed kickoffs accounted for 6 percent of all plays but 21 percent of concussions. With NCAA approval, they moved the kickoff line from the 35-yard line to the 40. The touchback line was also moved, from the 25-yard line to the 20. The NCAA approved the changes on an experimental basis for the eight private universities in the Ivy League. Other NCAA teams have kickoffs at the 35. The researchers compared the two seasons since the change with the previous three years. They found the average concussion rate per 1,000 kickoffs plummeted from almost 11 to just 2. Touchbacks increased to nearly 50 percent from almost 18 percent during the previous three years. Concussion rates for other types of play were lower than those for kickoffs throughout the study years and only declined slightly after the rule change. The research appears in the Journal of the American Medical Association. It was paid for by the Ivy League and Big Ten. “It’s very promising that we’re able to see an effect like that,” said Zachary Kerr, a researcher in the University of North Carolina’s exercise and sport science department. Kerr, who was not involved in the study, said the NCAA should take the results seriously as it considers policy changes to reduce injuries. While the Ivy League has been especially aggressive about modifying its playing and practice rules, all levels of football — from Pee Wee to professional — have taken steps to decrease the frequency of kickoff returns. The risks of the play, which creates high speed crashes, are common knowledge. Dartmouth College Coach Buddy Teevens eliminated players tackling each other at most of his team’s practices — even before the Ivy League passed a leaguewide rule about it. He also invented a robotic dummy that is used in tackling drills. Teevens said the decision to push up the kickoff line was made collaboratively among the Ivy League’s coaches. The NCAA implemented a new rule this season at all levels of college football that allows players to call for a fair catch on kickoffs that come down short of the end zone but inside the 25-yard line. A fair catch means the kick cannot be advanced and a ball carrier is not tackled. 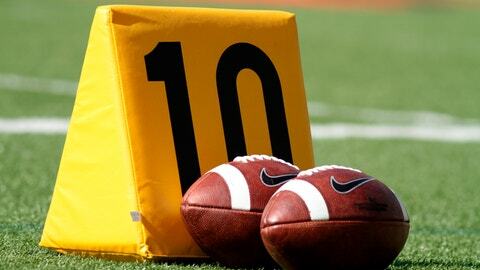 The result of the play is the equivalent of a touchback, where the ball is placed at the 25. The Ivy League uses the fair catch rule, along with kicking off from the 40. Boston University concussion expert Dr. Robert Cantu, who was not involved in the research, considers the return “the most dangerous play in football.” He noted that after data showed NFL concussions overall increased slightly last season, the league’s rules committee considered eliminating the kickoff return, but decided not to. “The Ivy League is really leading the charge into bringing about rule changes to make football safer,” Cantu said. In 2011, the NFL moved the kickoff line to the 35-yard line from the 30, but a published analysis concluded that overall kickoff play injuries dropped but not head injuries. While the Ivy League’s rule was an experiment, the study results likely will solidify it as formal policy, Wiebe said. “It’s a real public health success story,” he said.